On Friday Tom and I left our home here in western North Carolina to celebrate with her family and friends the life ofKatie, our former neighbor and dear friend of 26 years. To be exact, it has been a year and thirteen days since Tom and I moved to the mountains of western North Carolina. Our real estate agent and now dear friend Sandy Austin, said it best when she described our move here as “a leap of Faith”. It’s been a year full of wonderful “firsts” after my initial feeling of “how did we get here?” Here’s some photos of our little piece of the world. and some of the feathers they left behind! We have only been living in the mountains of western North Carolina for a few months but we've already been pretty entertained by a few of our neighbors. I took this picture from one of our bedroom windows because I didn't want to scare away these wild turkeys. I discovered once I went to get into the car to run an errand that I could have walked up behind them and taken a picture from two feet away. They were, as you might say, totally oblivious, looking down hill from where I was as if to say "do you hear something?" They only alighted (flying isn't their forte) to the trees when I started the car. 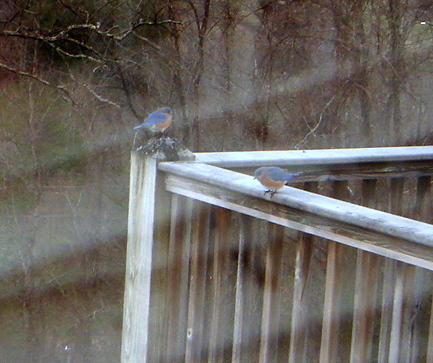 During the milder days of early December, I caught these bluebirds catching some sun on our deck. 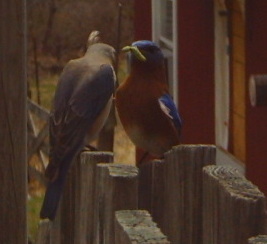 Time to build another bluebird house! Yesterday, while doing my run/walk/hike up our mountain, I saw these girls. They are skittish here, not so much on my runs in NJ when our herd would stand within five feet of me as I headed past them. 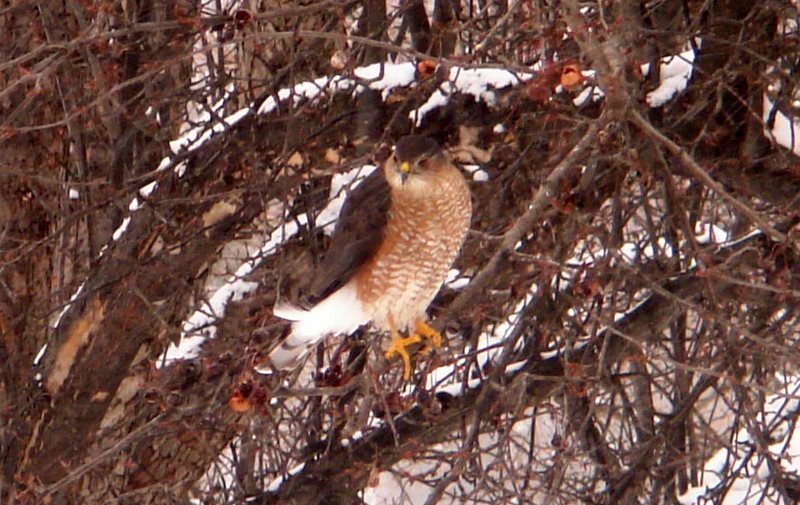 A bird, the likes of which I have never seen, was perched on one of our trees. I took a picture, but this photo that I found online is far superior to mine. If on a late afternoon walk across an open field you encounter a thorny honey locust tree with an impaled display of songbirds or field mice dangling in the wind — like macabre ornaments on some ghastly Christmas tree — you’ll know you’ve entered the “butcher shop” of a loggerhead shrike. To say that the loggerhead shrike is “fearsome” is not an overstatement. With an especially adapted beak that is hooked and notched, the shrike kills birds and mammals by biting them behind the head until the cervical vertebrae are severed. The male shrike has the distinctive habit of impaling captured insects, birds, mice and other prey upon handy strands of barbed wire or plant thorns and briars. Leftover portions are sometimes left hanging high and dry for later consumption. In a “Birder’s World” article, “Masters of the Macabre,” Matthew Douglas noted that, “Male shrikes accumulate larders for their own use and for feeding their mates and young. Larders usually reach peak size during courtship and incubation so maximal food is available when the young hatch. “While shrikes have a reputation for wanton killing, most evidence suggests they don’t kill more than is required for sustenance. It’s not clear whether most shrikes feed on cached food that is old. While some have returned to larders weeks after they formed them, others seem to avoid ones more than two days old. “Another function of larders may be as indicators of a male’s hunting ability. 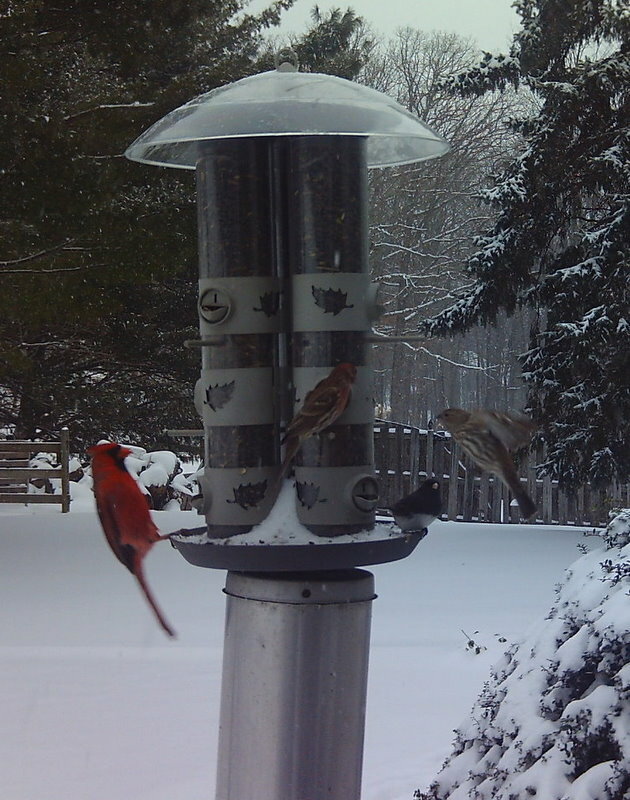 Evidence suggests a male with more food stored in larders has a greater chance of being selected by a female. Will keep you posted as to what's around the next bend! Now that we've made our move to our home just a little west of Asheville, NC, I continue to get the studio unpacked. One box that has been packed since we lived in Connecticut holds special meaning. 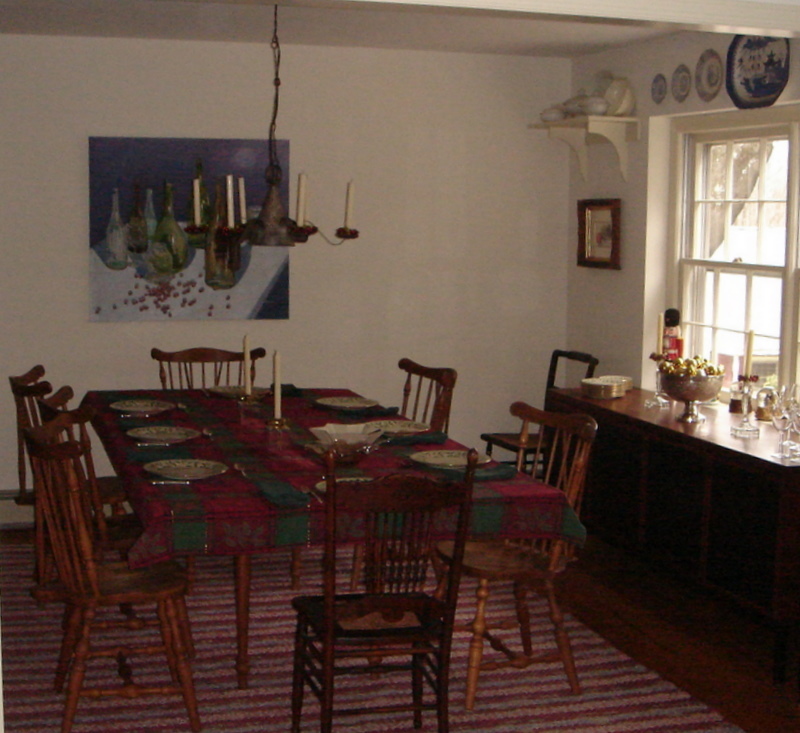 It contained some beautiful items pertaining to weaving, that once hung on the wall to the entrance to my studio. In our home in Clinton, CT, my studio was located above our garage and the hall way up the stairs, was a perfect location for these treasures. My studio, in a converted horse barn in Tewksbury Township, NJ, did not have a foyer or entrance way, and I was concerned that these wonderful items would get damaged during the daily movement of bolts of fabrics, finished rugs and boxes packed for shipping. Now that I have a foyer in my current studio which is out of the fray, these antique shuttles, prints, paper cuttings and an antique lap loom, hold a place of honor. One of my favorite pieces is this framed "Weaver's Prayer" with paper cuttings and calligraphy by my dear friend Martha Link Walsh. Another favorite is this hand colored wood cut print by Mary Azarian. It was given to me by Joy Kilbourn who was the owner of the beautiful home furnishings store "Cliffhangers" in Bronxville, NY. Joy carried our rugs for many years and it was such a pleasure to have known her. This famous phrase from L. Frank Baum's "The Wizard of Oz" pretty much sums up the events leading to our recent move to North Carolina. At this time last year, I could not have predicted the ups and downs and twists and turns that led us to our current home in the mountains. Although our home and bodies didn't get taken up into the sky by a cyclone, it sure felt like it at times. A rather abrupt change of employment for Tom resulting from the company he worked for basically imploding, caused us to do some quick decision making as to our future. Since our plan was never to stay in New Jersey indefinitely, Tom felt he should continue to send out resumes while simultaneously getting the house ready to sell and we would go with whatever came first. I think I could write a book about all of the events that followed, but in a nutshell, here goes: The house goes on the market, less than two months later we get a cash offer. Great! Not so great is that our buyers wanted a thirty day close. Mad dash to start to pack non-breakable items, moving company to pack the rest. Brakes put on when septic inspection reveals we need a new septic system. Good news is that we had a great engineering firm and excavators and I got to play on one of the big rigs! The weather and the fact that our excavators were backed up (so to speak) with work, gave us a chance to bring the contents of the studio (minus the 4,800 lbs. of looms that the movers were to transport) to a self storage unit in Asheville. A week later we travelled back to NC to look for a house, with the caveat that there be a space for the business. Low and behold, on the third day, the last house we saw, was the one on which we made an offer. Long story short, great house, great views, and more than enough room for the looms and the contents of my previous studio. I can't say any of this was easy, and at times (more times than I or Tom care to remember!) I wasn't sure I had it in me. What I do know, and what I truly believe, is that this is where we were meant to be, and as Dorothy said "there's no place like home." 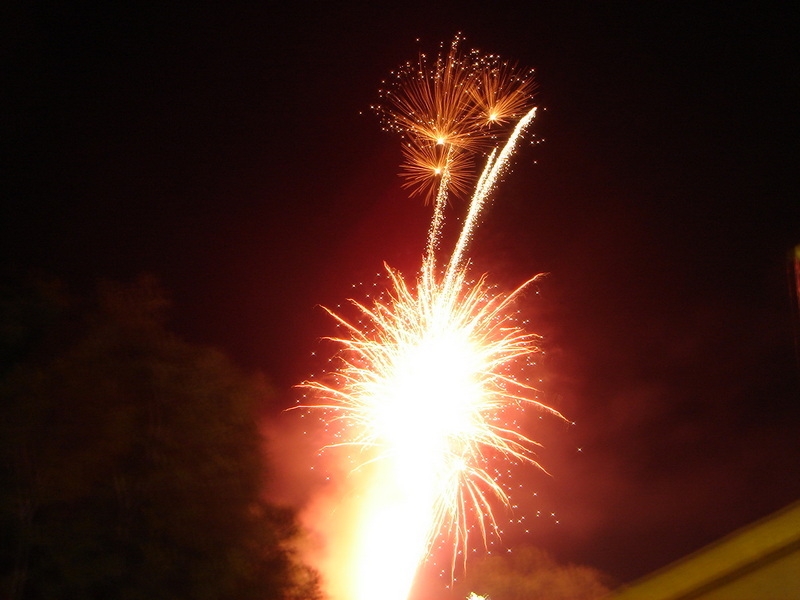 The Califon volunteer fire department once again out did itself with its fire works display. Tom and I took a seat on the Municipal building steps and were literally right under them! We are so proud of all of the men and women, past and present, who have fought in order that we might retain our freedom. Our family has served in all four branches of the armed services: my dad was a Marine, my father-in-law was in the Army, Tom was in the Navy and nephew Matt continues to serve in the Air Force. One of my favorite old movies is "Mr. Blandings builds his dream house" starring Cary Grant and Myrna Loy. The Blandings purchase a "fixer upper" in Connecticut, and then the fun begins. Probably my favorite scene is Mrs. Blandings describing to the painters the colors she wishes to have in the various rooms. Now that we are starting to show some long awaited color on our property, here are a few examples: for our cream we have "Andromeda"
and for our yellow, "Daffodil"
Sure enough, as mentioned in my last post, the bluebird momma has started feathering her nest, or in this case, building it with our ornamental grass clippings. The one in the photo below is at least 24" and she seems to be handling it with ease. 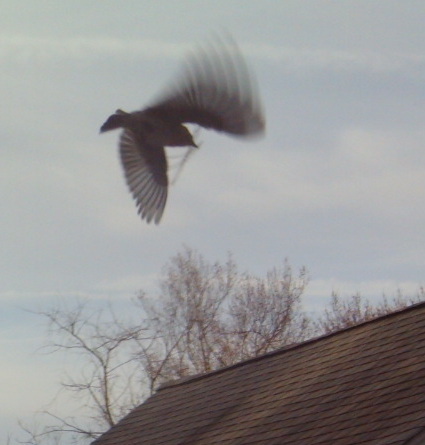 Here she is flying through the air with more nest building material in her beak. I can't tell if papa is checking out her handiwork, or helping. You can just see his tail feathers on the cage we added to the house to keep a raccoon from reaching his paw in to steal eggs. That happened to the first eggs laid two springs ago. So far, it has worked! I think she's resting after getting this long piece of grass up to the entrance. A little sit in the sun before dinner. 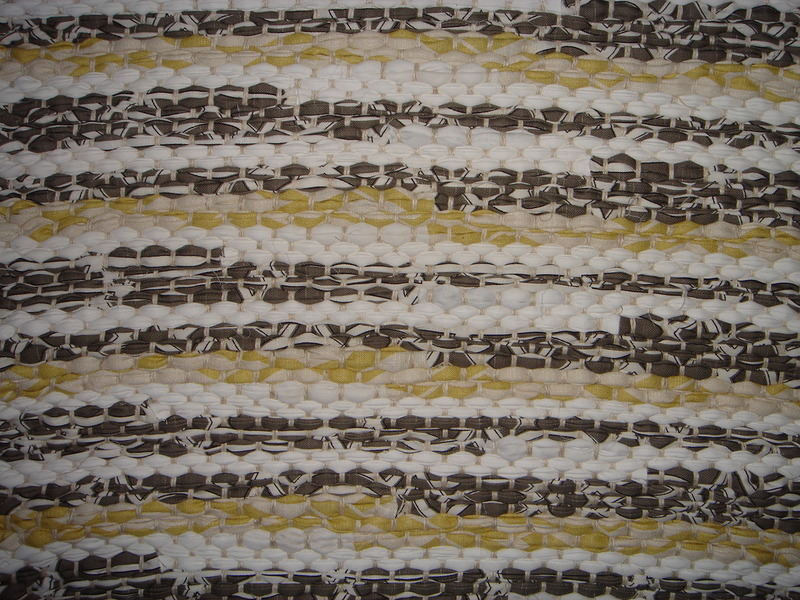 We just sent two rugs to a beautiful home in Winston-Salem, NC. The home has a country French flair so French blues with soft linen tones were in order. 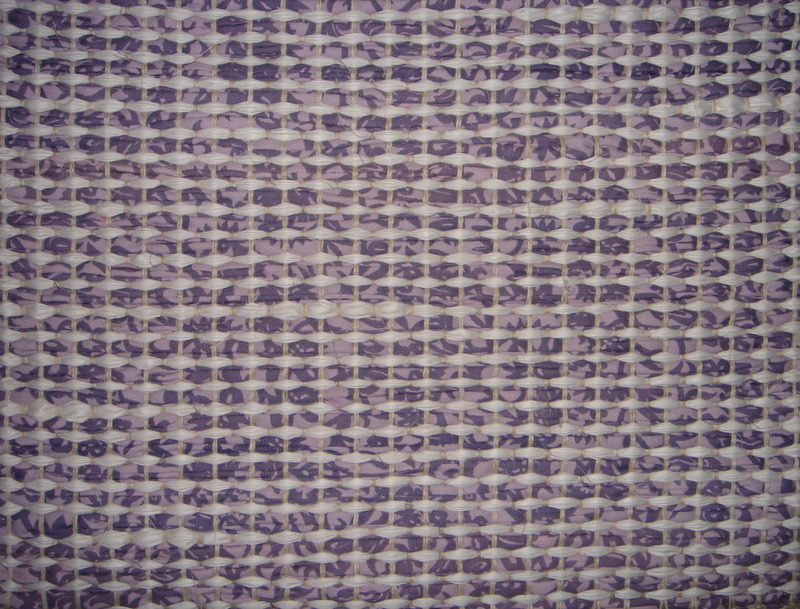 We wove a 6'x9' in our "Quartz" and a 10'6"x10'6" using a combination of the fabrics in our "Linen" and "Dove" along with accents of a different shade of blue which is also used in the room. We've also got blues of the feathered kind. 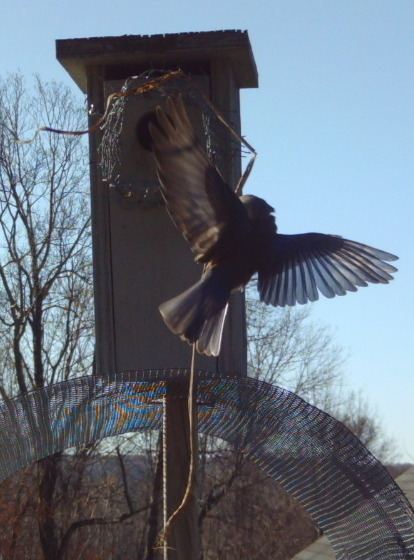 Our bird cam captured these photos of the soon to be inhabitants of our bluebird box! Nest building should begin soon! The snow that has been here for months was finally melting and then another storm arrived this morning. Here's the view from the door to the studio. 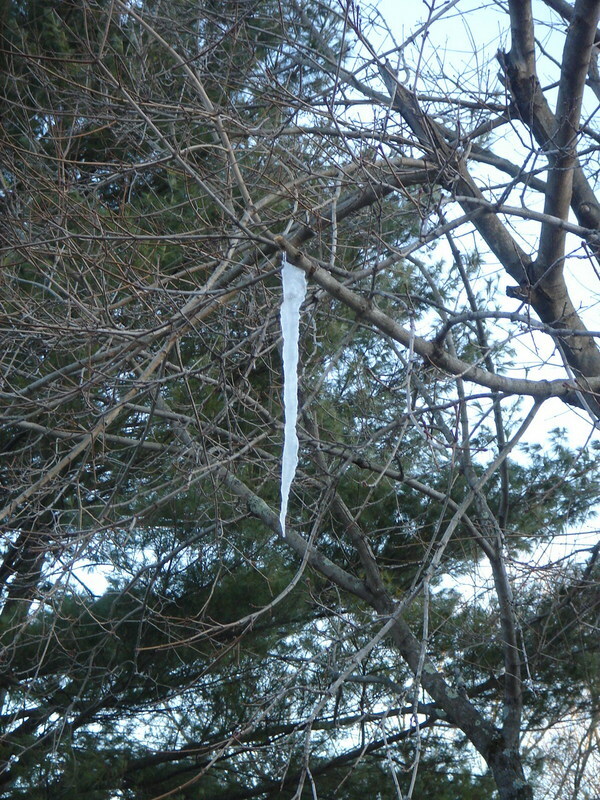 On a positive note, the sap is running as evidenced by this sap icicle! 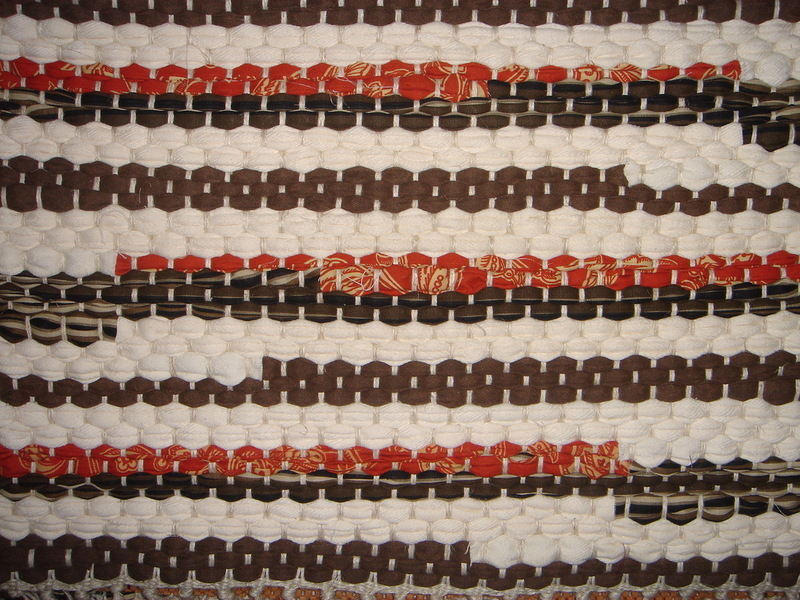 On another positive note, we shipped thirteen rugs to a beautiful home on the water in Florida. Here's hoping we soon get a taste of warm weather! While most people stayed off the road yesterday due to our latest snow storm, my commute only requires a walk down the hill to the studio. 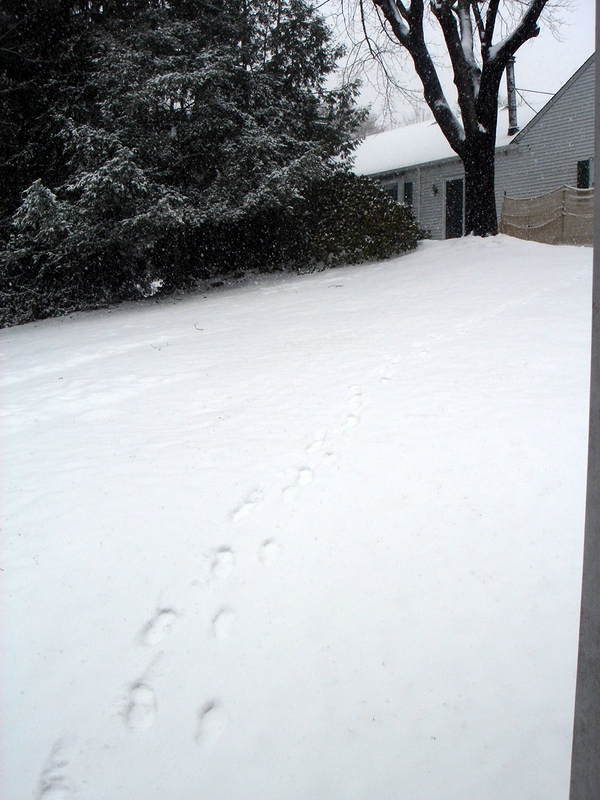 That walk has been tricky at best, due to the ice and snow that refuses to melt on the path that Tom made with the snow thrower. 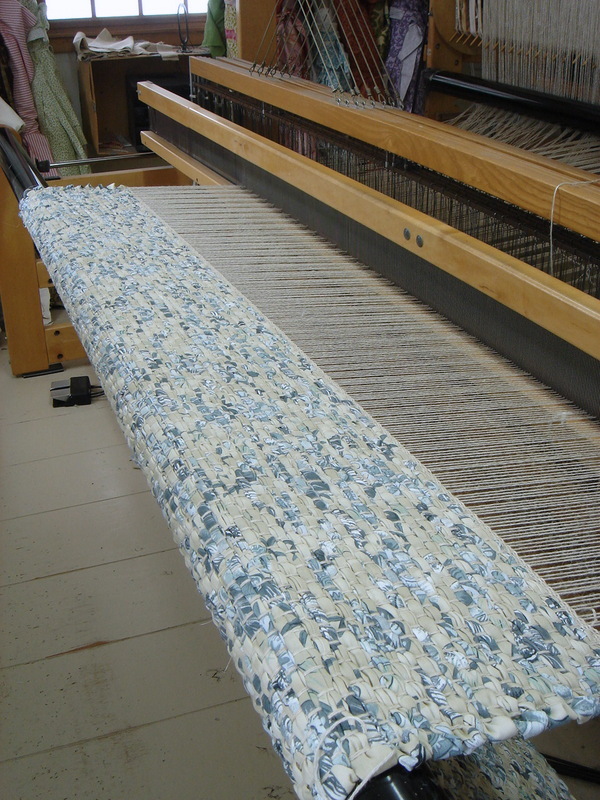 Never the less, it was warm in the studio as I began the first of twelve rugs that will be shipped to Florida. The view from the window behind me is a reminder that very soon, the bluebirds will be coming back to the house that Tom built. There really is a pond and pool behind this fence! 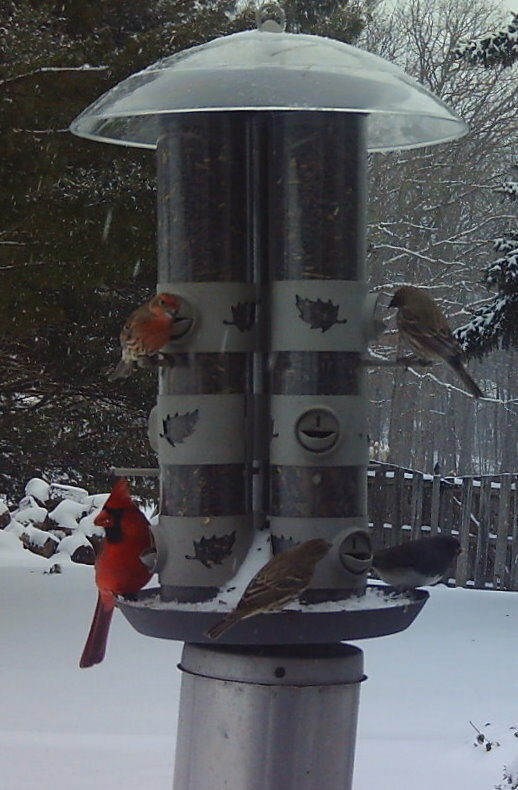 The cardinals seem to enjoy the sun today as they wait their turn before heading down to the feeder. We just bought another bag of sunflower seed for a total of 100 pounds since December. These two made a visit last week. 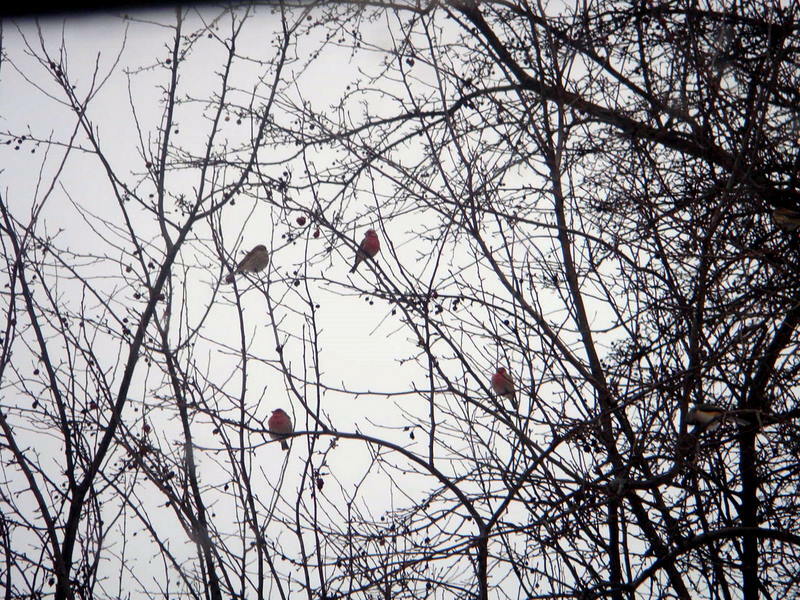 Birds hanging out in the crabapple tree in between trips to the bird feeder. This is what happens when you toss out stale salted pretzel chips! More snow on the way tonight! A few weekends ago we attended a wedding in Ashland, New Hampshire. 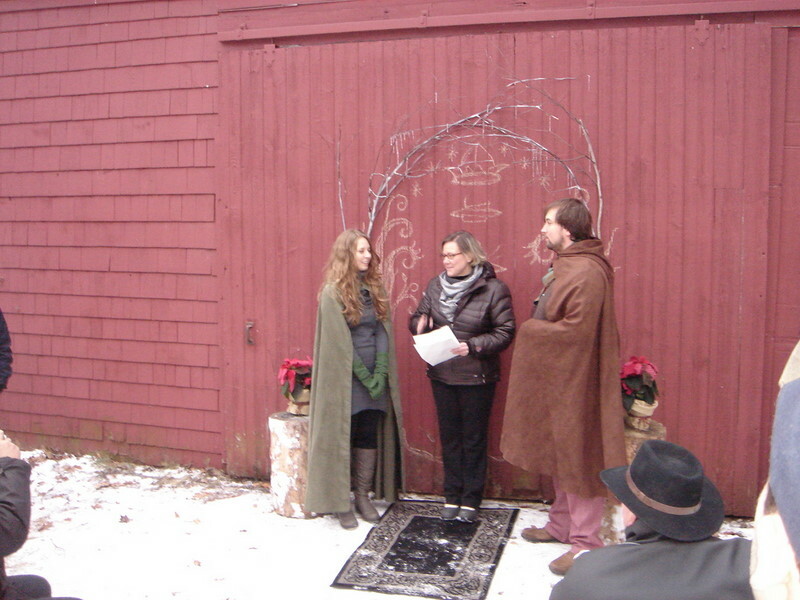 The short ceremony was outdoors. The temperature was 25 degrees and snow was in the air. A bit of a "Hobbit" theme going on here! The reception was in the groom's sister's barn! Coats were shed when a great band out of Boston called Strange Changes began playing. It was a great, fun time and by the time the evening ended there was over six inches of snow on the ground! We loved opening our home to our wonderful family and friends at Christmas. What fun it was to eat, drink, and enjoy much merry making! Tonight will be a low key ushering in of the New Year. We think a fire, a movie and some Chinese food sounds just about right! A Happy, Healthy New Year to all!! We hope you enjoyed a Blessed Christmas Day! Here are some of the highlights of our Christmas season. Our 9ft. tree being loaded onto the tractor. Heading to the baling station. 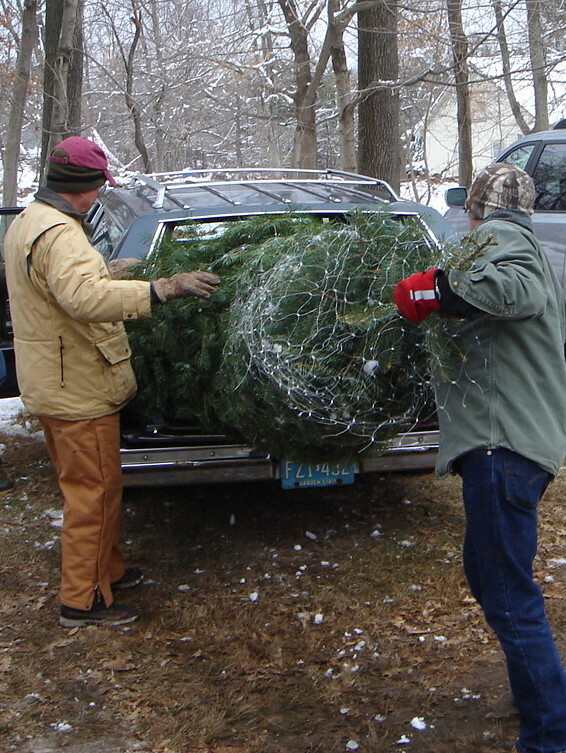 Our two trees being loaded into the Patti Wagon. Just a few of the many ornaments for the family room tree. Our table set for guests the Saturday before Christmas. The meringue mushrooms I made to go along with our "Birch de Noel". Cider brought his family, our niece Meghan and her fiancé Erik. Cider says "This sign doesn't refer to me, right?" 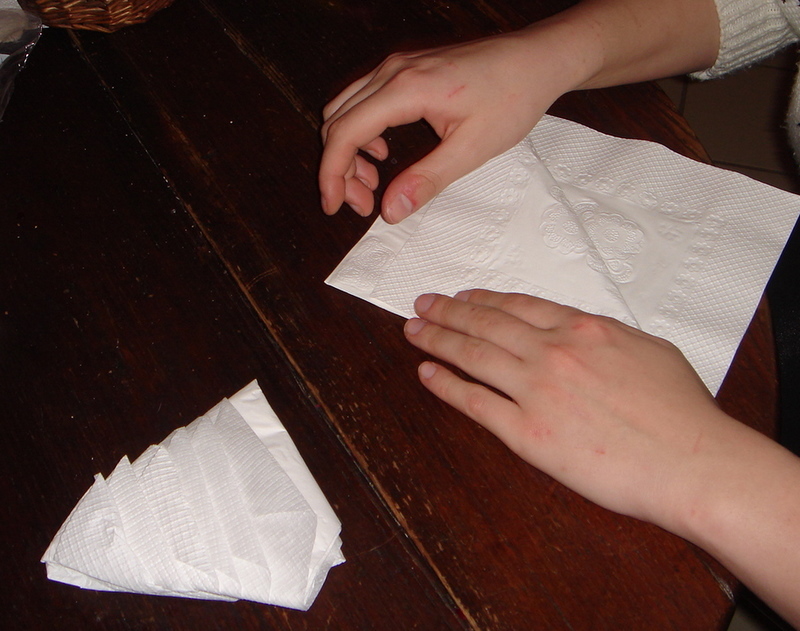 Niece Emily folding a napkin into a Christmas tree! 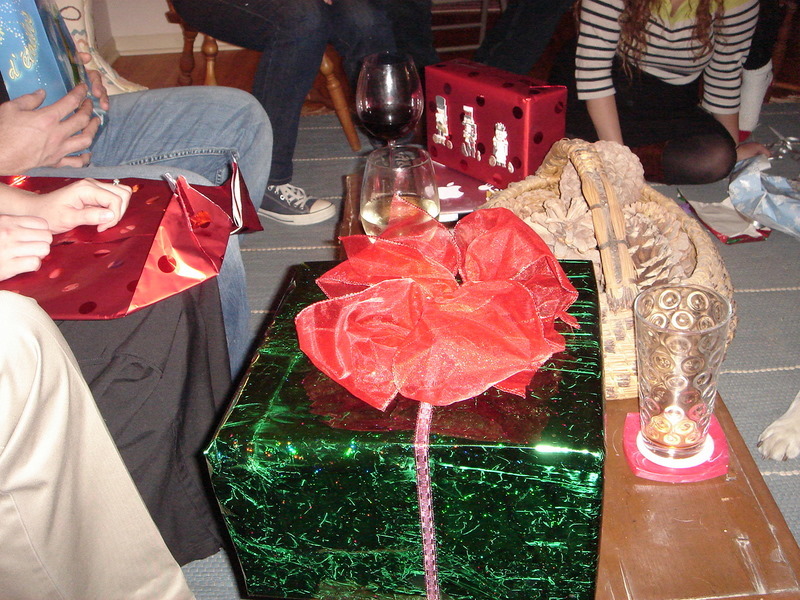 Christmas gifts and wine. It doesn't get better than this! 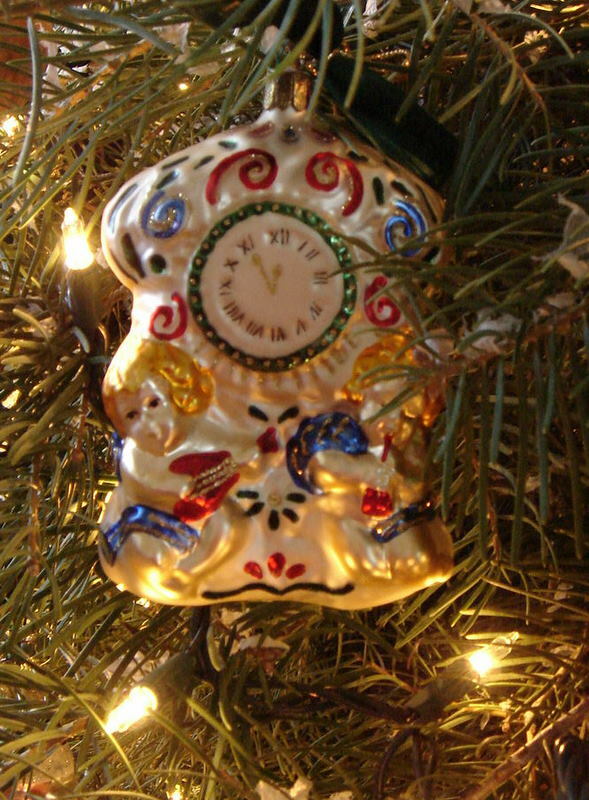 Wishing all a Blessed Merry Christmas and a Happy, Healthy, New Year!!! I've spent the last couple of weeks weaving a 9'x16' and a 12'x14'6" for a master bedroom and sitting room for clients of Elizabeth Bauer Design. The rugs are on their way to Puerto Rico! I've also just finished rugs for seven bathrooms for a client of Seldom Scene Interiors. These rugs are going to North Carolina. I'm hoping to post the rest of our Asheville trip in the next few days! Tom and I were headed back to our car after a fun casual dinner at WALK which stands for West Asheville Lounge and Kitchen. It was dark, and Tom had to move the car away from the bushes at the curb so I could get in. While I was waiting, I looked across the street to see what looked like a former garage used to fix cars. 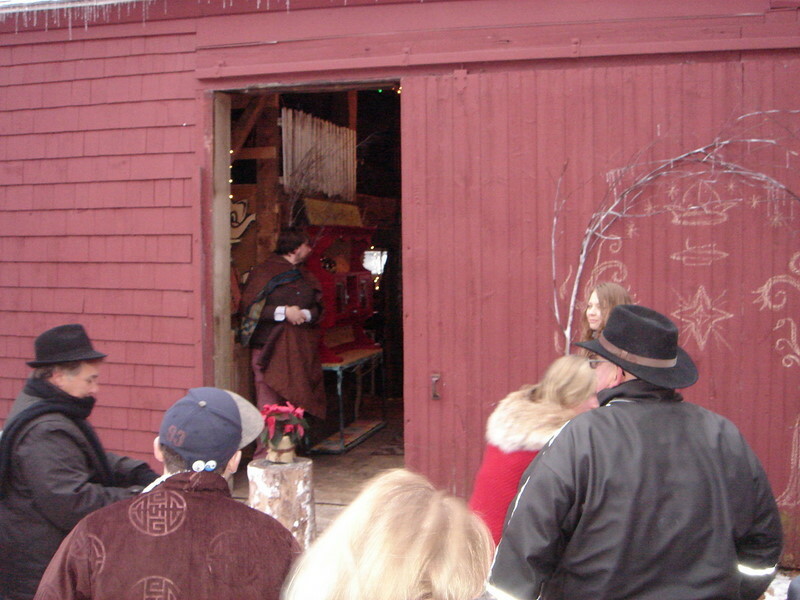 The large doors were open and I saw a bearded man among what looked to be a large amount of all sorts of objects. Intrigued, Tom and I walked across the street to see what exactly was going on in that building. Christopher Mello warmly greeted us and invited us in. Indeed, we couldn't stop looking at his collection of funny, odd, sculptural, and shall we say, interesting things. Turns out, this is Christopher's studio where he creates all sorts of pottery including but not limited to, baby heads,(flying and otherwise) small skulls, which were still in the kiln, hearts, and acorns which could easily have been used on the set of the Hobbit movies. One could describe Christopher's domain as macabre, but the tongue-in-cheek design of his displays and his own sweet personality, turns it all into a fun "what's around the corner?" adventure. We had a great time seeing all his studio had to offer, but Christopher also wanted us to see his garden. Well known for his great artistic ability, he is equally known for the fun and fanciful garden he has created. Our photos depict a much different nighttime view but Pam Penick has some great images of his garden in the daylight at her blog Digging. I was able to get a shot of the shovels that rim the garden. One of the many fun and amazing things was the huge spider's web that was woven by Christopher! I had great fun snapping photos of Christopher as he was "caught" in his own handiwork! Thanks so much for the great tour, Christopher! Can't wait to visit again. Spooky deer on our hill!